Drink your way around the country with the finest craft suds from Alabama to Wyoming. 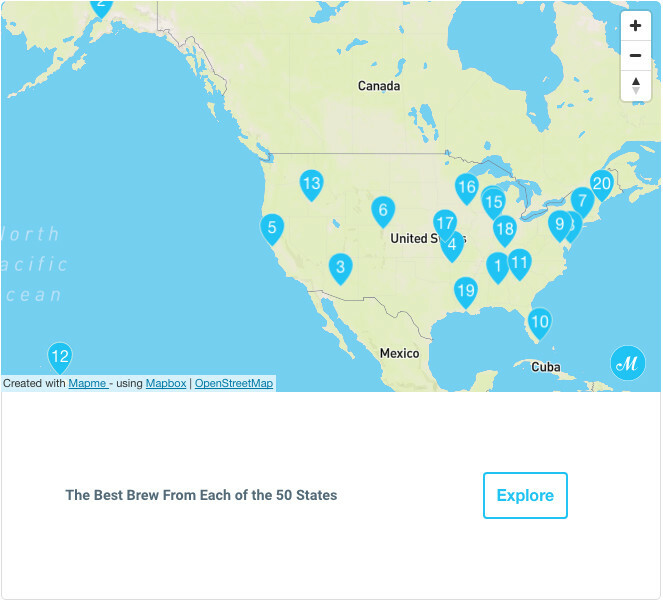 In this age of the internet, a well-programmed robot could easily put together a pretty decent “Best Beer in Every State” listicle. Scrape results from Beer Advocate, RateBeer, BeerGraphs, even Untappd, and you’d have a fairly competent nifty 50. But screw the algorithms and user reviews—we all know a highest-rated beer isn’t necessarily an overall best beer. Scan any user-generated beer rankings and you’ll see the top of the list dominated almost completely by hazy IPAs, adjunct-crammed imperial stouts, and barrel-aged sour oddities—the more limited the higher-ranked. But that entirely misses the point of what it means to be the best. Just like the scissor-tailed flycatcher is the state bird of Oklahoma, or the ponderosa pine is Montana’s state tree, the following are the brews that should be the official state beer of their respective localities. Shameless congressman ought to immediately issue floor bills to honor these beers. In fact, you know what—just go ahead and add ’em to each state’s Wikipedia page if you’re so inclined. You may argue with some of these picks, but unquestionably they’re all great beers. Some have been around since the 1990s, helping pioneer the state’s entire craft beer scene from its infancy, while others have existed for less than twelve months and haven’t even been drunk by your average beer fan. We at First We Feast did a similar exercise back in late 2012—a mere three-and-a-half years ago, but a lifetime in the world of craft beer. Back then, now-ballyhooed breweries like J. Wakefield, Side Project, and de Garde didn’t even exist, and a Hill Farmstead and Tree House barely did. As you can imagine, that previous list is, by our count, 91% different from this one. With help from some friends in the industry—local experts, some of them fellow writers, some just good ol’ fashioned drinkers—here is the best beer for each and every state (plus Washington D.C.).